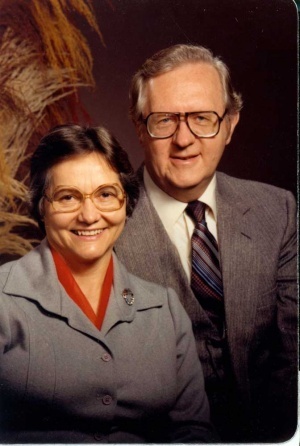 Ross Thomas Bender: educator, pastor and seminary dean, was born 25 June 1929 to Christian K. Bender (2 August 1888-20 December 1960) and Katie S. Bender (5 July 1891-8 June 1950) on a farm near Tavistock, Ontario. He was the youngest child in a family of four sons and one daughter. On 22 December 1950 he married Ruth Eileen Steinmann (8 July 1931-13 December 1997); they had two sons and three daughters. Ross Bender died 21 April 2011 in Goshen, Indiana. Ross grew up in the Cassel Amish Mennonite Church, a branch of the East Zorra Amish Mennonite Church that was established in a former Evangelical Church. He was baptized at Cassel on 10 October 1943 by Bishop Daniel Iutzi. His father, Christian, a leader in the congregation's Sunday school, valued education and took two years of high school through continuation school at a time when this was very rare among Amish Mennonites, and continued to read widely throughout his life. Ross's oldest brother, Walter, almost completed high school as an adult, and encouraged his family to give Ross the same opportunity. Ross, who was not inclined towards farming, completed high school and took summer school classes to qualify for elementary school teaching. Over a six year period he taught in three elementary schools in Oxford County, Ontario and took course towards his BA at Toronto Teacher's College (formerly Toronto Normal School) and the University of Western Ontario. He completed his BA at Goshen College in 1954. Ross had a good singing voice, and was part of a Bender Quartet during these years. With the encouragement of leaders like Nelson Litwiller, Ross and Ruth Bender decided to pursue seminary studies at Goshen Biblical Seminary, with the vision of mission work in South America. This did not develop, and so in early 1955 Ross accepted a position at Rockway Mennonite School in Kitchener, Ontario to serve as Dean of Students with part-time teaching and student recruitment responsibilities. The position attracted the Benders as Ross hoped to serve on the pastoral team at the Tavistock Mennonite Church which was seeking additional pastoral leadership, and where they had attended after their marriage. Bender completed his requirements for a BD degree in December 1955 and for the MRE degree in March 1956. Bender and a older farmer were nominated at Tavistock for ordination in 1956. When the supervising bishops ruled the other candidate not suitable there was dissension within the congregation and the ordination process was terminated. One issue was the uneasiness of some persons in the congregation about seminary-trained pastors. Unexpectedly the Principal at Rockway resigned in mid-April 1956 and the school's board asked Ross to take the position of Principal. He accepted and served in that role until 1960. In 1958 Bender was invited to join the Goshen Biblical Seminary faculty after some pastoral experience and additional academic studies. The Mennonite Conference of Ontario requested that he be ordained by his home conference to facilitate his leadership role at Rockway School. The Ontario Amish Mennonite Conference executive agreed to this unusual procedure in early 1958, and he was ordained at the Steinmann Mennonite Church by Bishop Ephraim Gingerich on 28 May 1958 for "ministry-at-large." The Erb Street Mennonite Church invited him to serve as an Assistant Pastor, which involved occasional preaching and working with the youth; he served in this role until 1960. With the promise of a seminary position, Ross Bender went to Yale University for graduate studies in 1960. He completed an MA and PhD at Yale in 1962; his dissertation was on "The role of the contemporary family in Christian nurture: a theological perspective." He began to teach at Goshen Biblical Seminary in 1962. In 1964 Goshen Biblical Seminary and Mennonite Biblical Seminary, already in a cooperative relationship known as Associated Mennonite Biblical Seminaries, each named him as Dean. In this role he led the "Dean's Seminar" from 1967-1969. This study project developed a model for theological education in the Free Church tradition, and redesigned seminary training for Mennonite pastors. The fruits of this work shaped the seminaries' teaching program for a generation. His work at combining the curricula of the two seminaries was key to encouraging the move of the Goshen seminary to the Elkhart campus, as well as the increasingly close relationship of the seminaries. Bender served as Dean of the seminaries until 1979. He also served as Professor of Christian Education until his retirement in 1996, and as director of the Institute of Mennonite Studies beginning in 1991. In 1996 he was named Dean Emeritus of Associated Mennonite Biblical Seminary. Ross T. Bender also undertook major assignments for his denomination. From 1961-1971 he served on the Mennonite Commission for Christian Education, serving as its chair beginning in 1963. After the Mennonite Church restructured in 1971, during a two year leave he served (1972-1974) as the first executive secretary for the new Mennonite Board of Congregational Ministries. He was moderator of the Mennonite Church from 1981-1983, and served on its executive board from 1979-1985. He also served as President of Mennonite World Conference from 1984-1990. Through this latter association he participated in a wide variety of ecumenical relationships, including a trip to Russia for the millennium of Christianity in 1988, and co-chairing theological conversations between Mennonite World Conference and the Baptist World Alliance from 1989-1992. During a six year leave from the seminary he also served as pastor of the Glennon Heights Mennonite Church in Colorado (1984-1989). In all the positions that Ross T. Bender held he was valued for his sensitive leadership and creative thinking. He was also known for his gentle sense of humor, often used in a self-deprecating way. During the last two decades of his life, Ross was less able to participate in church and seminary activities because of the effects of Parkinson's disease. His interest in the seminary and the church did not waver to the end. Ross and Ruth Bender are buried at the Violett Cemetery in Goshen, Indiana. Bender, Ross T. Interview by Sam Steiner. Waterloo, Ont. (28 May 1991). "Bender, Ross T." Waterloo Region Record (25 April 2011): B7. Bender, Wray L, and D C. Bender. A History of the Tavistock Mennonite Church, 1942-1992. Tavistock, Ont: The Church, 1992. Klassen, Mary E. "Church administrator known for caring approach, gentle humour." Canadian Mennonite 15, no. 10 (16 May 2011): 28. Steiner, Samuel J. Lead Us on: A History of Rockway Mennonite Collegiate 1945 1995. Kitchner, ON: Rockway Mennonite Collegiate, 1995. Bender, Ross T, and Alan P. F. Sell. Baptism, Peace, and the State in the Reformed and Mennonite Traditions. Waterloo, Ont: Wilfrid Laurier University Press for the Calgary Institute for the Humanities, 1991. Bender, Ross T. Christians in Families: Genesis and Exodus. Scottdale, Pa: Herald Press, 1982. Translated into Spanish as Bender, Ross T, and de M. M. J. Padilla. Cristianos En Familias: Genesis Y Exodo. Cuidad Guatemala: SEMILLA, 1982. Bender, Ross T. Education for Peoplehood: Essays on the Teaching Ministry of the Church. Elkhart, Ind: Institute of Mennonite Studies, 1997. Bender, Ross T. The People of God. Scottdale, Pa: Herald Press, 1971. Bender, Ross T. Tending and Mending the Creation: My Experience with Parkinson Disease. Goshen, Ind: Ross T. Bender, 2007. Steiner, Sam. "Bender, Ross Thomas (1929-2011)." Global Anabaptist Mennonite Encyclopedia Online. July 2011. Web. 24 Apr 2019. http://gameo.org/index.php?title=Bender,_Ross_Thomas_(1929-2011)&oldid=163116. Steiner, Sam. (July 2011). Bender, Ross Thomas (1929-2011). Global Anabaptist Mennonite Encyclopedia Online. Retrieved 24 April 2019, from http://gameo.org/index.php?title=Bender,_Ross_Thomas_(1929-2011)&oldid=163116. This page was last modified on 31 January 2019, at 16:02.